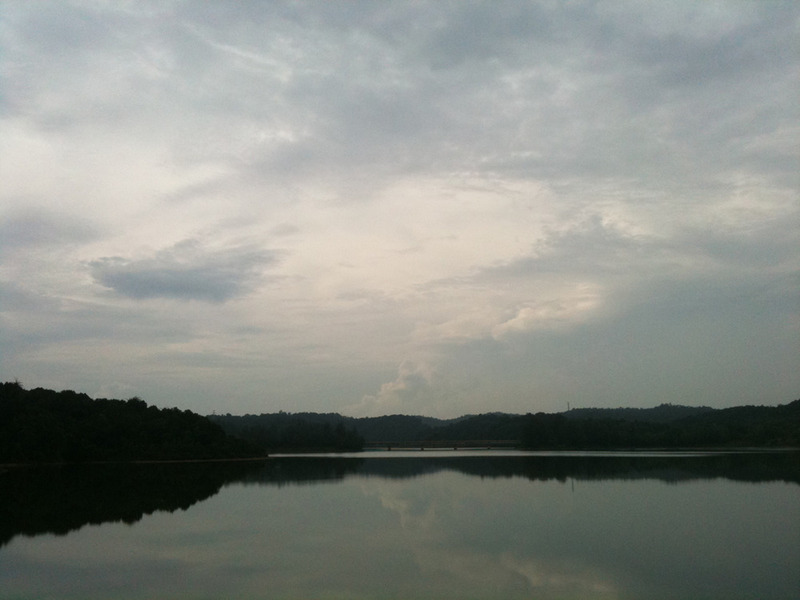 I took a walk along the side-path of the reservoir near my home yesterday. The cemented side-path laid on top along the periphery wall of the reservoir. The wall functions as boundary separating the reservoir and the lower surrounding area. In one corner of the reservoir lies a huge water outlet that leads to a river. Through this outlet, excessive water would be released to the river when the level rise higher than what the reservoir could hold, to prevent flooding roads and buildings nearby. Early that morning, the atmosphere was serene at the reservoir and the wind breezy. As I paused to rest from walking, I could see the effect wind-shear had made upon the water. Seen from the shore, the effect made the reservoir felt alive. But not long after, the wind went silent. The water calmed and tree branches were motionless. Dark trees and grey sky above the reservoir were reflected on the water. Behind these trees, layers of hill appeared fainter and fainter the farther they are away. This scene reminded me many of Michael’s work where it showed the deep silent of nature. Being in a place like this felt rewarding.